Michael H. Wysong enlisted in the Air Force in 1967 and served seven years on active duty as an aircraft weapons technician. His assignments included tours in Korea, Vietnam, and Thailand. He entered the Air Force Reserve in 1974 and was assigned to McGuire Air Force Base, New Jersey as an Air Reserve Technician, a federal civil service position with duties comparable to his Reserve assignment. He served as a Flight Instructor and Flight Examiner Loadmaster on the C-141 aircraft, amassing more than 8,800 flying hours. He rose to the rank of Chief Master Sergeant and held the position of Aircraft Loadmaster Superintendent. In 1993, he was selected as one of the U.S. Air Force Twelve Outstanding Airman of the Year. 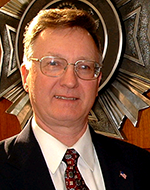 He served as Chairman of the Air Force Enlisted Council (1994) and Air Force Reserve Council member (1995-1997), and, through the Air Force Association, advised the Secretary of the Air Force and Chief of Staff of the Air Force on matters concerning personnel and hardware issues requiring policy changes and legislative initiatives. Mike retired from the Air Force in 2005 after 38 years of total military service. Mike was employed as the Director, National Security and Foreign Affairs for the Veterans of Foreign Wars of the United States in Washington, DC from May 2005 until his retirement in June 2009. In this position he was responsible for representing and promoting VFW interests, views, and goals before various U.S. government policymakers, elected officials, congressional committees, federal agencies, other veterans groups, and military/defense coalitions. He worked closely with all branches of the armed services and the Departments of Defense, State and Homeland Security. He developed the strategy and implemented the VFW National Security and Foreign Affairs program. His duties also took him on numerous global fact-finding missions to visit with U.S. Armed Forces personnel, U.S. government officials, and host nation leaders. Mike is an elected government official, serving on the Plumsted Township Committee since January 2012. He previously held a position on the Armed Forces Heritage House Museum Board of Directors and will continue to serve as Chairman of the Government Relations Committee.